I had the supremely awesome chance to surprise one of my best friends this past week. I hitched a ride with our mutual best friend (Knitting Whisperer) and hid in the car until they were all ensconced inside. And it was legen-wait-for-it-dary! Let’s just say there was screaming and jumping up and down. So much more gratifying than the time I surprised my mom and she greeted me with a scowl of consternation as she growled, “What are you doing here?” She was expecting my brother. I’m not saying she loves him more than me….but, you be the judge. In addition to all the fun visiting and touring we did, my dear friend decided she wanted to be assimilated…I mean, learn to knit. It turns out she’s a natural. Sitting on the couch with madeira, yarn, and my besties – a day I thought would never come – I had to document the occasion. 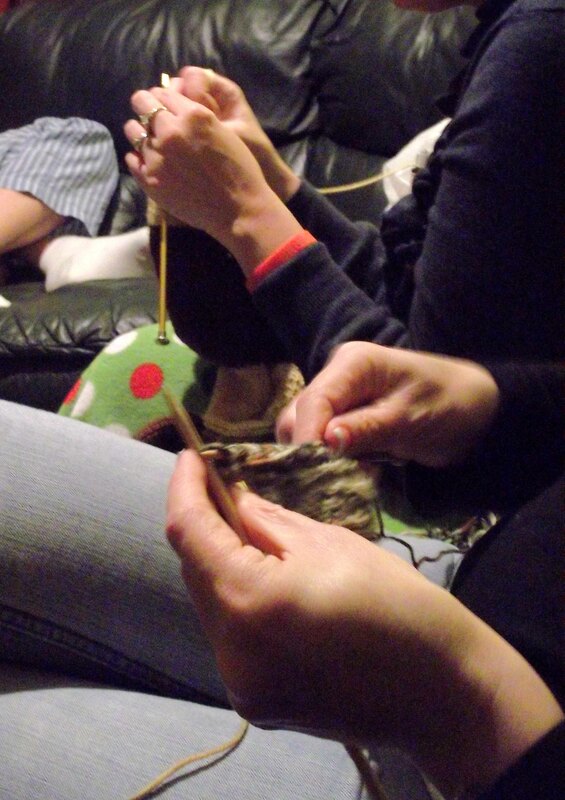 Knitting Whisperer is in the back and newest knitter is in the front working on her first swatch - look at her go!